Amish Decor is not only trendy but eco-friendly! Are Eco-labels Essential for Green Products in India? Does Recycling Lithium-ion Batteries Help The Environment? Can We Raise Our Baby in Eco-Friendly Parenting Way? In an arena of shifting trends, and shifting lifestyle choices, sustainable fashion is here to stay. Earlier, the association of the environment and fashion signified raising funds for charitable purposes. However, now, the association of fashion and the environment has taken on a more eco-friendly tone. Designers today are opting for the use of environmentally friendly methods and material for production of entire collections. Various Indian fashion brands are becoming completely organic and sustainable. From weaving to dyeing to stitching every aspect is taken care with a consideration for the environment. Of course, ecologically sustainable clothes are expensive, but we get the best quality products that are long-lasting and offer a healthy choice. Big labels like Fabindia, Hidesign, Mother Earth are making a mark in the Indian market for eco-friendly fashion. Fabindia is arguably India’s first dedicated chain of retail showrooms that sells handcrafted products with organic elements. Established in 1960, it started as an export house in Delhi and today has become a successful venture in retailing Indian textiles in a wide range of designs. The main products of Fabindia are: textiles, furniture, personal care products and organic food products. Fabindia’s garments have a modern touch and yet they use traditional techniques like handloom weaving and handmade accessories. 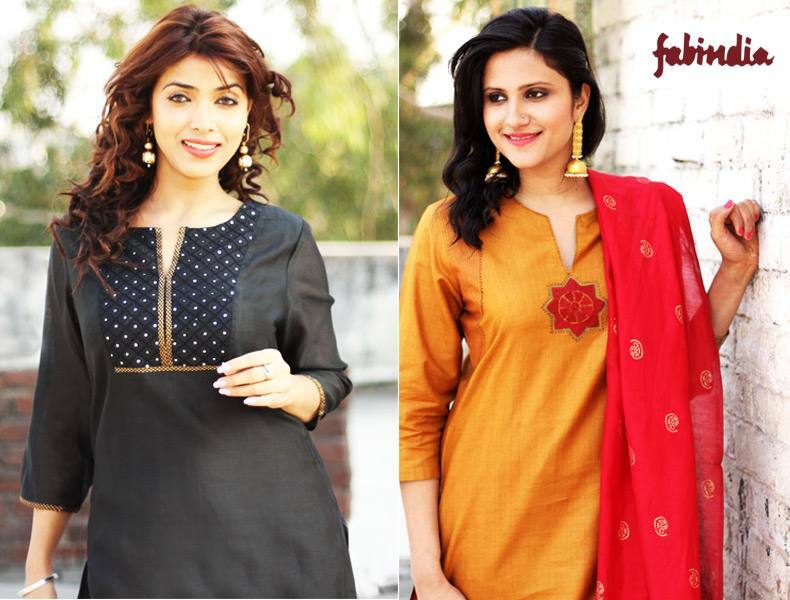 Each ensemble that comes out of Fabindia shows a sense of warmth for nature. Apart from providing a wide range of fashion goods, Fabindia connects rural artisans to urban consumers, thus creating an opportunity for employment and preserving India’s traditional handicrafts in the process. Over the last 50 years, Fabindia has refined the art of sourcing from craftsmen by eliminating middlemen and directly sharing a portion of its profits with artisans. No doubt, it is considered to be one of the most profitable retailers in India. Hidesign a luxury leather goods manufacturer based in Pondicherry. Established in 1978, Hidesign’s products are known for their impeccable finish and ecological standards. The finest quality leather is used and the products are tanned using plant seeds and barks. The benefits of vegetable tanning are it uses natural tannins and the colors produced look more natural. The leather is not polished with chemical paints to hide any defects and the products can be recycled as well. Further, hand-polished solid brass buckles enhance the look of the product. Emphasizing the product’s eco-friendliness, waste water from the factory is filtered and reused. Hidesign’s collection includes handbags, belts, wallets, laptop bags, etc. This globally recognized brand sells its products under the affordable luxury category and is available not only in India but abroad as well. 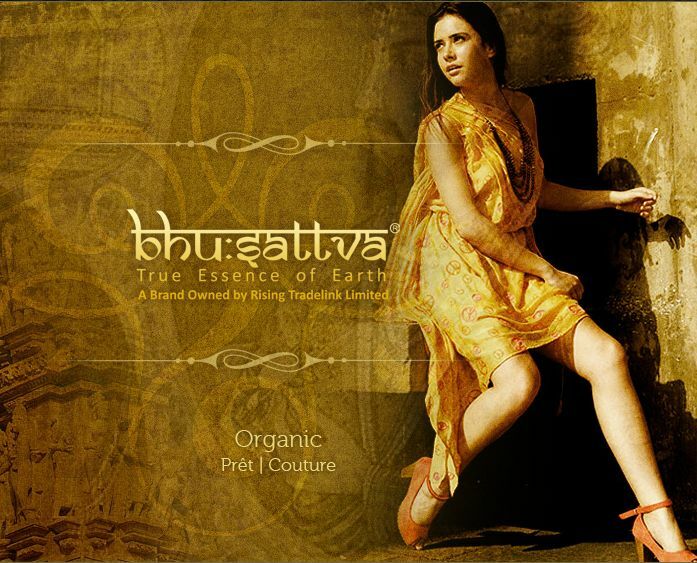 Bhu:sattva is an organic clothing brand based in Gujarat. Established in 2009 by Ahmedabad-based organic foods company Rising Tradelink Ltd, “Bhu” means earth and “sattva” means essence. This brand goes out of the way to utilize purely eco-friendly fibers such as hemp, organic cotton, cruelty-free silk, soya fiber, banana fiber, modal, milk protein fiber, pineapple fiber, flax, jute and others. Bhu:sattva produces “Ahimsa silk”, which is an Indian origin cruelty-free silk made from Eri and Tussar silk cocoons. Its apparels are hand-block printed with herbal dyes. Bhu:sattva also uses 100% certified organic cotton fabric, which is procured from voluntary organizations in South India. Finest designers, best organic fabrics and natural dyes are chosen to create this sustainable product. Natural dyes are made from beetroot, turmeric, indigo and other extracts of leaves and flowers. Mother Earth sells ethnic design apparel home furnishings, and other home goods through stores of its own. Mother Earth is a brand from Industree Crafts Pvt. Ltd, which was established in 1994. The company believes in offering high quality goods while nurturing the environment and creating sustainable livelihoods for marginalized rural communities. Its products can be mainly categorized into apparel, furniture, gift & home decor, natural fabric, home linen, crockery, fashion accessories and organic food. Mother Earth’s products are well designed in a traditional way by rural artisans, who are mainly women. The company works with handloom producers and 40% of products are made by self-help groups. The natural fibers used are banana, palm leaf, bamboo, sisal, water hyacinth etc. Mostly home furnishings such as furniture and accessories are made from these natural fibers. Aranya Naturals is a project based in Munnar, Kerala which is involved in manufacturing naturally dyed textile products. It aims to empower disabled youth by employing them in the art of extracting natural dyes. It is beautiful to see handicapped children master the natural dying techniques and make fine quality hand made products like sari, shawl and paper products. Aranya is a project of Shrishti Welfare Centre and is supported by Tata Global Beverages Ltd. Aranya stands out in batik, block printing and mordant printing. The raw material is chosen from various natural raw materials such as seeds, pollens, dried tea leaves, flowers, pinecones, etc., which are sourced from nearby states. Organic manure is produced from the residue of raw materials, whereas tea fiber residue is recycled into handmade paper. 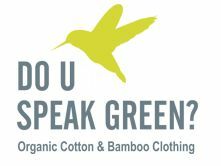 Do U Speak Green (DUSG) claims to be India’s first online shopping store for organic clothing, which are mostly made of organic cotton and bamboo. It exports high quality knitted organic fabrics to leading international brands and has received the Carbon Footprint Mark from SGS. DUSG’s products are manufactured by Tirupur-based Fusion Clothing Co, who are exporters of knitted clothing certified with Global Organic Textile Standard (GOTS). DUSG supports the Bombay Natural History Society and also contributes 10% of sales for environment maintenance. 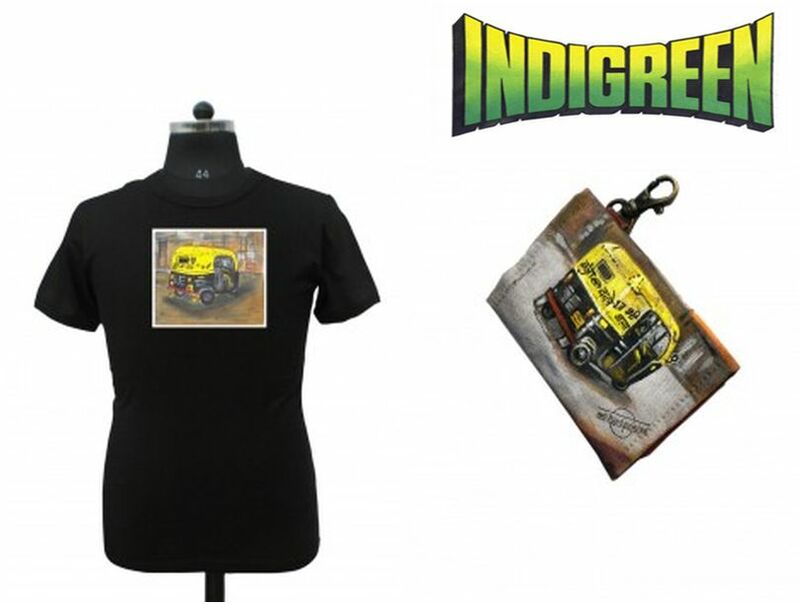 Indigreen can be described as a combination of Bollywood style Indian pop art and eco-friendly clothing. Indigreen uses certified organic cotton, bamboo fabric and khadi as raw materials, on which funky Indian pop art designs are hand painted. Indigreen is 100% eco-friendly, 100% fair trade and 100% Indian. By engaging the women from NGOs like SEWA, Indigreen is able to maintain fair trade values even as expands its retail base. It make sure that any embellishments incorporated into the Indigreen collection are handcrafted by women, artisans who are supported by fair trade NGOs and the painting artists receive a proper artist fee. Around 10% of the company’s profit is donated to local NGOs and The Climate Project-India. Further, Indigreen uses plastic bags that naturally biodegrade in the environment when exposed to sunlight and air. 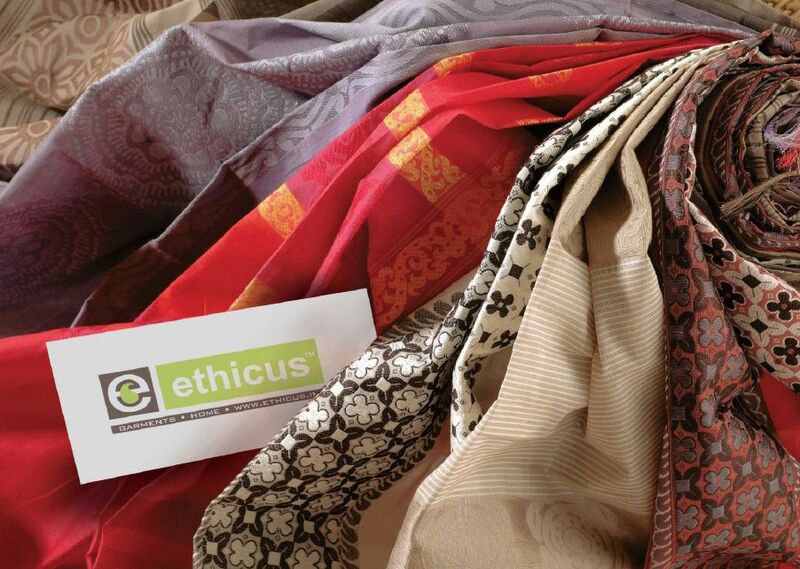 Ethicus is a brand from Appachi Cotton, a company based in Pollachi, Tamilnadu. Ethicus products such as sarees, organic clothing and home linens are handcrafted by rural artisans using traditional weaving methods. These handwoven fabrics are made up of 100% ethical silk and organic cotton. Only natural dyes are used and sarees are woven using traditional techniques on handloom. Ethicus products are now available in 30 retailers across India. Appachi Cotton’s Eco-Logic initiative reduces the role of middlemen and gives direct benefits to the farmers. Ethicus respects the craftsmen by putting their names and picture on every product. It is included in the top 10 brands internationally for promoting organic cotton. Samtana is a Bangalore-based organic t-shirt brand. Samtana is based on an interesting concept of ‘Wearable Art’– which is a way to build a community of designers and promote art from across the globe. Each t-shirt has a unique design that is truly artistic and awe-inspiring. The cotton is obtained from. Founded by Ben and Bharat, Samtana produces organic cotton t-shirts. Organic cotton is sourced from the Cotton Corporation of India, which is supplied with GOTS Certified yarn from farming cooperatives in South India. Bio-wash method is used so that toxic elements are not added to the t-shirt in the washing process. Ecoideaz is hell bent on proving that sensible green ideas do emerge from India. It is eager to build a comprehensive portfolio of all eco-friendly ideas developed in India and create a repository for innovative green ideas both from the investor and consumer perspective. I am Nisha Singh, from Mumbai. Me and my husband are launching a store based on e commerce which will be launched wef 15 April at our hometown. The company formation is in hand and will be completed by 31st march, 2016. The products will be available through our App and subsequently we wish to expand it to Pune also, as soon as our website is ready. this is our start-up venture and we look forward to your cooperation. What is a Root Zone Waste Water Treatment?